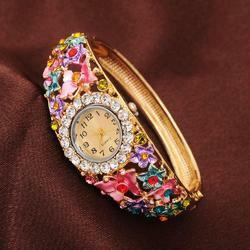 Fashionography has a wide range of Imported women's watches. Whether you go for a party or wedding or there is occasion, this watch will help to add a touch of sophistication.This particular design has beautiful crystal flowers and leaves and is very uncommon to people around you.It is a perfect gift also for your loved ones. 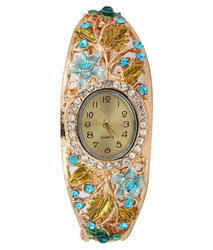 Enhance your grace with this Stylish Bangle Watch which can suit your ethnic/modern wear. We are manufacturing wide range of Bangle Watches. Spread the word about this Gossip(R) watch! Suitable for any occasion. Stainless steel caseback. Japanese quartz movement. A white mother-of-pearl dial graces the silvertone cuff watch. Silvertone hands tick time away on the cuff model. Approximate measurements: Cuff band 1/2"W. Cuff case 7/8"L x 7/8"W.
Doma Shah Mohan Lal Jewellers & Co.